The Russellville Cyclones basketball program has been building toward[more] this season since the five seniors that started Friday night’s 7A/6A-Central Conference game at Bryant were sophomores. In fact, the team’s top six players are seniors with plenty of experience through the highs and lows — mostly lows — of the last two seasons. That experience is paying off this season. Though the Cyclones will be competing for the Class 6A State title in the post-season, they are currently playing in the mostly 7A Central Conference. Coming into Friday’s league contest against the Bryant Hornets, Russellville was already the lone unbeaten team in conference play and they retained that distinction with a 53-38 win. It was a frustrating night for the Hornets who had designs on making up a disappointing loss at Van Buren on Tuesday — a game they felt they should’ve won — with an upset of the surging Cyclones. They kept it close for three quarters but when the fourth period started with Russellville’s Eric Turner and Grey Harris drilling 3-pointers to produce a double-digit lead, the Hornets couldn’t get it back under 10 the rest of the way. Further frustration was gleaned from the fact that, at Van Buren, Bryant couldn’t seem to buy a break or a call and Friday, even though they were at home this time, such things didn’t seem to go their way again. Despite the fact that the Cyclones played tight, physical defense on the ball while holding and grabbing at times off the ball, Bryant only attempted nine free throws in the game. Three times late in the game, Bryant players were knocked to the deck away from the ball to no consequence. 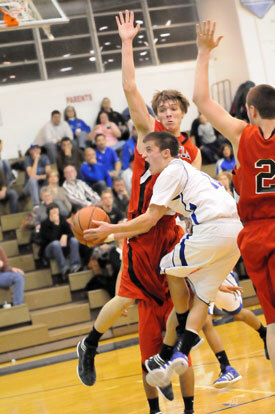 Russellville scorched the nets at a 55 percent clip from the field (16 of 29) including 6 of 10 from 3-point range. But it was the stingy defense by the Cyclones that proved the most crucial. Bryant out-rebounded the Cyclones 24-22 including 12 caroms on the offensive end. The Hornets also forced 15 turnovers while committing just 10 producing 17 more shots from the field. 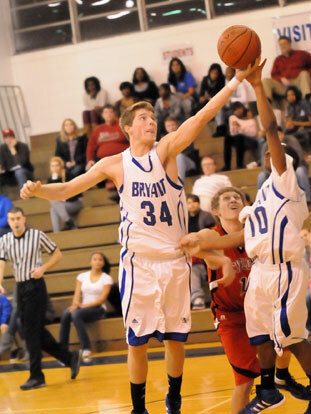 But Bryant shot just 35 percent including a tough 0-for-13 from 3-point range on their home floor. Turner wound up hitting five triples by himself on the way to a game-high 20 points. Harris added 11 for the Cyclones. Jordan Griffin led Bryant with 14. Quinton Motto added 8. At 6-7, Motto gave the Hornets’ their best match-up advantage on offense and he scored the team’s first 4 points. But Russellville used ball pressure and solid help defense to make it tougher and tougher for Bryant to get the ball to their big guy. Russellville started the game building a 13-4 lead, a run that including a pair of Turner’s treys. Griffin got Bryant on the comeback trail with a pair of jumpers from the wing, plus a free throw that had the margin down to 13-9 at the break. The Hornets kept the surge going to start the second period. Motto hit the offensive glass for a bucket then Black made a steal and fed Leon Neale for a hook that tied the game. After Turner scored, Black converted twice from the line after a strong drive to the hoop. After Harris missed on a 3-point try, Black drove for a basket that put the Hornets up by 2. The game went back-and-forth without any scoring for a while. Finally, with 3:17 left in the half, Griffin’s three-point play off a drive to the rack bumped the margin to 20-15, Bryant’s largest lead of the game. Turner drilled another 3 to trim it to 2 again. And, after a Bryant miss, the Cyclones had a chance to tie it up but Brantley Cozart made a steal and was fouled going to the rack. He converted once to make it 21-18. Dakota Young scored after that and Bryant’s lead was just 21-20 at the half. The lead disappeared on a basket inside by Harris to start the third quarter. Turner knocked down another triple and the Cyclones were ahead to stay. Gamely, the Hornets kept it close. 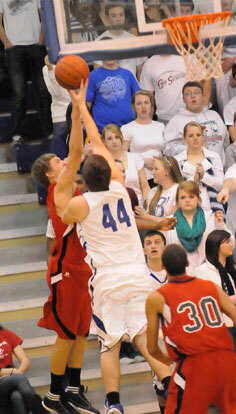 Cozart canned an 8-footer and, after Kyle Jones scored, Motto hit a reverse layup to cash in on Griffin’s steal. Still, going into the fourth quarter, Russellville held a 34-28 lead. And when Turner again opened up the stanza with a 3 and Harris followed shortly thereafter with another, the Cyclones had a double-digit lead. Bryant could not get it under 10 down the stretch. Russellville’s last field goal was a post-up shot by Harris that made it 42-30. Jalen Hewett took a feed from Anthony Black for a layup to cut it to 10 one last time but the next 11 points came from the line for the Cyclones as they spread the floor. Guards Jordan Barrett and Chris Washington combined to go 11 of 14 in the final three minutes of the game. Bryant’s attempt at a rally kept being thwarted in frustrating fashion. The Hornets attempted no free throws in the fourth quarter and shot just two in the entire second half. Now 9-6 overall and 1-2 in conference play, Bryant travels to Conway on Tuesday, Jan. 17. Three-point field goals: Bryant 0-13 (Griffin 0-4, Black 0-2, Cozart 0-2, Neale 0-2, Wilson 0-2, Rainey 0-1), Russellville 6-10 (Turner 5-7, Harris 1-1, Washington 0-1, George 0-1). Turnovers: Bryant 10, Russellville 15. It is absolutely horrible that we can not seem to get calls at home. What is more frustrating, it tends to be the same three refs. They should be banned from the Hornet nest!!!!!!! I’m not blaming the loss on the refs, Russellville has a great team, so not to take anything away from them.